We had so much fun creating Fish Tank Luminary that we made one for Valentine's Day. My Husband(Mr.J) is a music lover and works on music compositions during his free time. We(CJ and I) made a Music notes luminary as Valentine gift. He liked our gift. 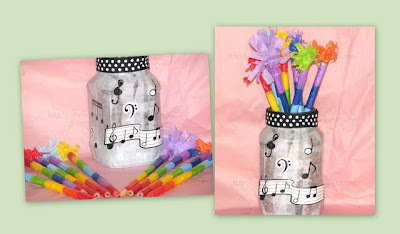 Though he is not using it as luminary, Music pen stand decorates his Music table. Cut white Tissue paper into 1.5 or 2 inches wide and 3 or 4 inches long strips. This time we used smaller length strips. Thin Mod podge my mixing a small portion of it with water in a Styrofoam container. Stick the Music notes sticker and apply a coat of gloss-lusture mod-podge. Spruce up by Wrapping a Coordinating ribbon to the neck of the bottle. What a cute light! 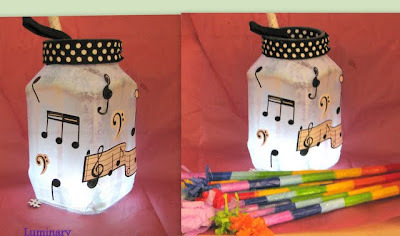 Luminaries are so much fun, and I love the music notes! Aaaah and a fun music jar!!! Perfect for your wonderful pencils! Hi, Esther! these turned out fab! thanks for linking up last week! hope to see you again this week! have a nice weekend! aww pretty! thanks for linking in to our DIY party! Beautiful! 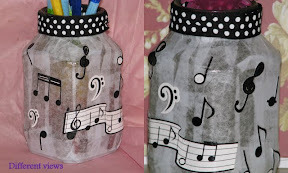 I love the black and white musical motif, and the way you trimmed it with polka dot ribbon! It turned out beautiful. Very cute project that we'll be making soon.